I know there are many out there who feel that we have enough versions of Kira and are tired of getting new ones. To everyone, I implore: please don't throw vegetables at or Guillotine me. I'm just the messenger and unless you want to start a war with Caesar, I would suggest you simply listen and ponder my words. Next order of business. How did you do in the contest? Did you guess correctly? Well in either case, the important thing is that this version of Kira is good. She was a long time in coming, as Kira commanded the Defiant on numerous occasions. The question was more a matter of what she would do and when. 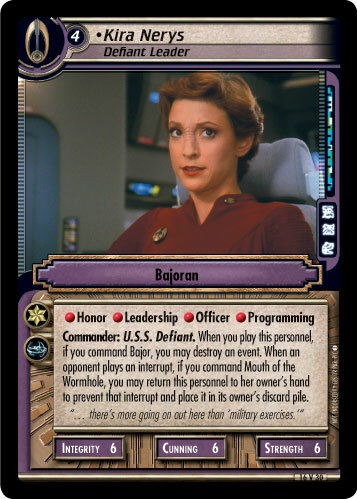 Here's your answer: she will help Bajoran decks nuke events and she will help Benjamin Sisko (Command Staffer) nuke interrupts, which is something Deep Space 9 decks are more concerned about in the age of Suprise Amity. After all, Deep Space 9 is all about protecting its stuff, including the freedom to complete two missions in one turn. Combine the two headquarters and you have a self-sustaining powerhouse. Situation: you're in a matchup, you are playing your redesigned Deep Space 9 Captain's Log deck. You play your Kira directly to your U.S.S. Defiant (Patrolling Warship) at cost minus two thanks to two copies of Captain on the Bridge. You choose to destroy that copy of Machinations your opponent was hoping would stop you from completing your space mission since, well, he has a lot fewer options for stopping your corresponding Commanders. You complete the mission and move on. Then on his turn, your opponent attempts to cheat by your dilemma using an interrupt. Kira returns to your hand and stops that cold. Then on your turn, you simply replay Kira again and choose another event to destroy. Nice. Kira also has some hidden uses. With her Programming, she can help your Captain's Log deck complete Automated Repair Station and Advanced Battle Simulation - two popular missions for that deck type. She has a printed cost of four, so she qualifies for a boost from Worf (Defiant Commander) and will help Bajoran decks get past The Dal'Rok. Even if you decide not to play a Bajor/Mouth of the Wormhole deck, you can still get the corresponding benefit from each respective headquarters. Kira is certainly a solid card and if I'm having to play against her, then my first thought is: "Woe to the Republic."